We’ve tabulated the results for My Yard Our Message and the 50 winning signs are posted. The wisdom of crowds looks like it has paid off, too: the winning designs really are the cream of the crop. The top vote-getter is “peace,” by teri_kwant, with 130 people saying they would put the sign in their yard. If anyone wants to share the entire set of winning signs on another site, I’ve set up a simple widget, as seen to the right. We were very pleased with the results of voting: Over 900 users registered to vote, and over 24,000 votes were cast. There was a flurry of voting in the first two days after voting opened, then a steady trickle, with another uptick before voting closed. One cool feature in the project is the neighborhood aspect. We’re seeding three neighborhoods with sets of winning signs. Lindsey has more details about this in the ECP blog. To facilitate the community gallery aspect of the project, we’ve set up a signs map that we hope everyone who has a sign will use to let us know where it is. There aren’t many signs yet, but eventually there will be. To manage having many signs on the map, we’re using a handy google map plugin called Cluster Marker. This allows the map to automatically set the correct zoom level to see all the signs, but hide signs that would otherwise be too close together at a high zoom level. Every time I work with google maps, I am please with how robust and thought-out the map api is. 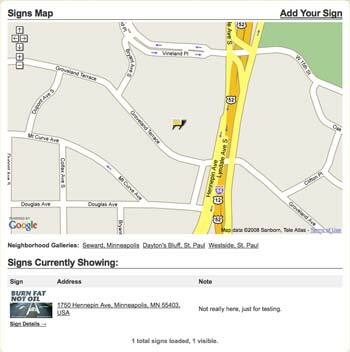 It will be exciting to see the map flesh out as people add signs to their yards.